The Israeli Left Archive is devoted mainly to the radical left and the women's peace movement in Israel during the sixties, seventies and the eighties. It is in this period, immediately preceding the introduction of computer technologies, that the bulk of the Kaminer collection was gathered. We stopped collecting material towards the end of the eighties mainly due to the spread of computerized documentation throughout society and the left. From the early nineties, the preservation and the recovery of movement materials became a vastly simpler goal. 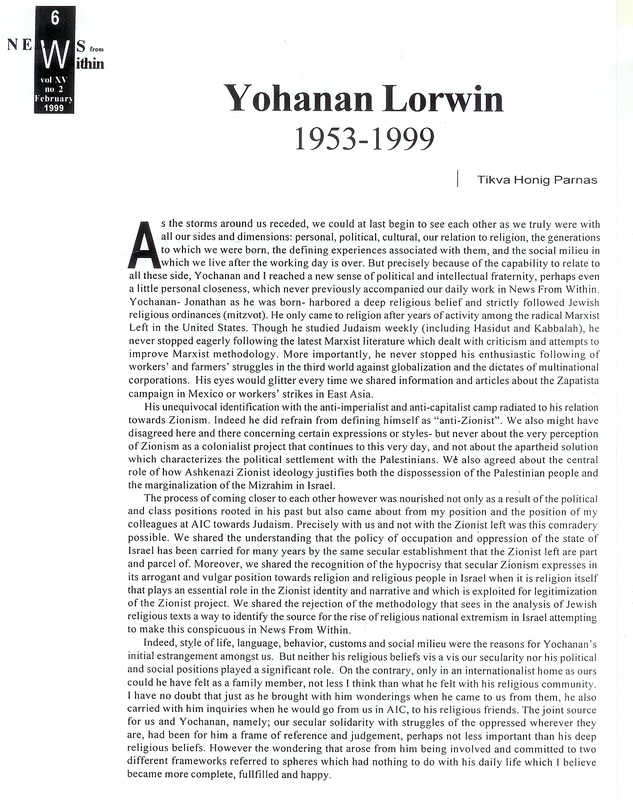 We are honored to dedicate this website of the Israeli Radical Left to the memory of Yohanan Lorwin (1953 - 1999). Yohanan Lorwin was born in the United States in 1953 and came to Israel in the eighties where he studied law and was accepted to the Israeli Bar. Yohanan, who had become a respected and loved figure in the Jerusalem left, died in a tragic accident, along with two other colleagues and friends, during a flash flood in the Judean Desert in 1999. 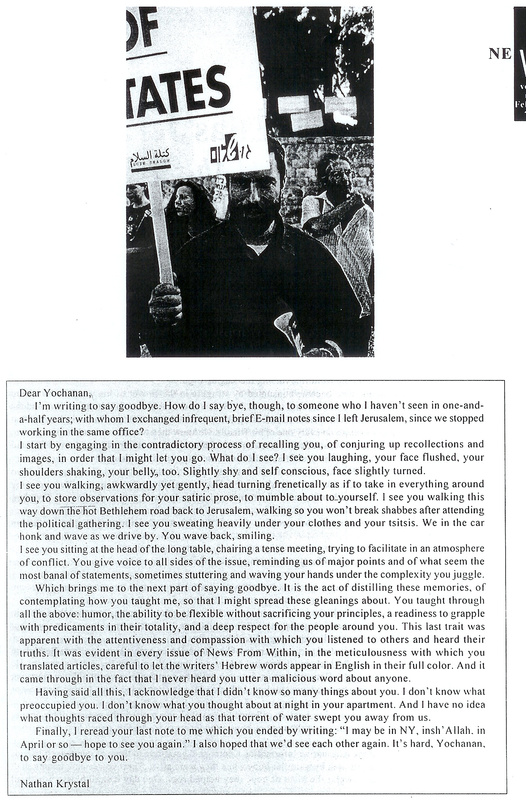 While still in the United States, Yohanan was drawn to the ideas and activities of the left. However, Yohanan, who was an independent and original thinker, felt that Marxism neglected the spiritual side of the individual and social life. This was the background for his decision to become a devout Jew and to deepen his study and understanding of Judaism. During the eighties and the nineties, he was active in the left in Jerusalem and a member of a progressive orthodox congregation in Jerusalem. During this period, Yohanan joined the staff of the Alternative Information Center as a writer, editor and translator. It was not, of course, a simple matter for Yohanan, who always maintained his individual political independence and his status as an observant Jew, to integrate himself into the secular atmosphere of the AIC. In his will, he requested that his friends and colleagues continue the work of the radical left with which he was so closely associated and among whom he found friends, who admired and loved him. The materials in this archive were collected by Dafna and Reuven Kaminer and the website itself was built by their granddaughter, Carmel. The website, originally built and stored in the Kaminer home in Jerusalem, is now hosted by the International Institute of Social History in Amsterdam, Netherlands. The 20 collections are converted into EAD and published as one collection in 2017, which is going to replace the website. The basic categorization is based on the different groups active in the radical left. We cannot presume to have gathered complete records of the work of the various groups. But we are sure that the materials included in the archive give invaluable and comprehensive insight into the work and struggles of those who trail blazed the paths to peace and equality in this country. In order to assist readers who do not know Hebrew, there is a special collection of documents in English. There is also a special collection of posters, and a collection of periodicals. Not covered are the parties of the Zionist Left or the Communist Party of Israel, represented over the years in the Israeli Knesset, because these well established parties issued a steady stream of information and materials over the years through their own newspapers and party press. These materials, which are of course, essential for following the work of the left, are generally available from standard library and institutional sources. The data of the website are converted into EAD in 2017.